Mary Donahue welcomes you to her De Anza College faculty website. I’ve been on the faculty at De Anza College in Cupertino, California, since April, 1988, first in Physical Education, then in Biological and Health Sciences as well. I’ve also taught at various Adult and Community Education centers, City Recreation Departments and have taught other groups as diverse as the staff of the Sunnyvale Senior Center; the staff of James Ranch/Harold Holden Boy’s Ranch (for the County of Santa Clara Probation Department); the Girl Scouts; Saratoga-Los Gatos, Milpitas and Fremont Union High School District staffs; Federal Court staff; De Anza’s Security staff; various corporate wellness centers and trainees for the California Conservation Corps. I’ve taught various subjects as a volunteer at the Santa Clara Valley Red Cross, the college, Harker Academy, the San Tomas Neighborhood Association and for Campbell/Cupertino/Saratoga/Los Gatos/Monte Sereno Community Emergency Response Team (CERT) training exercises. 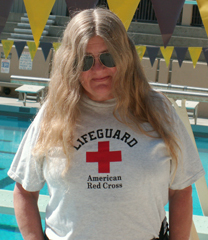 I’m a Red Cross certified instructor, primarily in lifeguard training, swimming, first aid and CPR/AED. I am also a Lifeguard Instructor Trainer, CPR/AED Instructor Trainer and Water Safety Instructor Trainer. I have been a member of the De Anza College Academic Senate Executive Committee since April 2012. 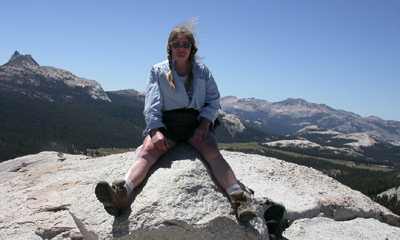 Shortly into my term as a De Anza instructor, I became the Senior Faculty Advisor to the Outdoor Club. Look at Outdoor Club Basic Info for details. I’m proud to have been a lifeguard, lifeguard captain or in charge of the swim of 53 triathlons or open water swims. I have been a volunteer with Yosemite National Park Preventative Search and Rescue since March 2014. Go to Personal Info for more about my resume. I usually teach every level of swim class each year. One of my favorites is Novice swimming (P.E. 26A/ KNES 001A). It’s a class for VERY beginning swimmers – including people who have never been in a pool or are even afraid to get in a pool, as well as people who can swim some, but are not confident in deep water. Health 57A Hlth 57A, First Aid for the Community, Home, Wilderness and Disasters, is a one-unit class that is offered at De Anza almost every quarter. You can get the Red Cross certification or just take the class to learn first aid. The class meets for only four sessions, not all quarter and is done before finals week. I teach the American Red Cross swimming teacher certification class, Water Safety Instructor (WSI) off campus. You can become certified to teach swim lessons for all ages, Safety Training for Swim Coaches and Basic Water Rescue courses. I teach the American Red Cross Lifeguard Training certification class and an occasional Lifeguard Instructor certification class off campus. Contact Info: I prefer that my students talk to me in person in class. When I am in town I usually check my email at least twice a day. Volunteering at the 2017 Escape from Alcatraz Sharkfest swim. They were just taking a selfie . . . In early 2016 the server for the first De Anza College faculty websites was near failing and faculty were told to move their websites off of it. As I have the time I will finish fixing links to and within pages. In late October 2006 the original De Anza College version of my faculty website, one of the first at De Anza, received its one millionth hit. April, 2008 it received its two millionth hit. In late 2009, the three millionth. In late 2010 it had four million hits, in late 2011 five million. In March 2016 the server was failing and I moved the faculty website here. Some of the most read pages at this website, when It was on the De Anza College server, were: (as of early 2016) Blood donation FAQs had 467,129 hits, How to pass a Red Cross written test had 379,415, Oxygen administration quick facts had 367,923, Lifeguard Training FAQs had 306,358, History of swimming section (which is used as a homework assignment by a professor at a Texas college) had 274,292 hits, fatal, near fatal or close call incidents/accidents in camping, backpacking, climbing and mountaineering had 145,081, How Can I Tell If I Am a Good Swimmer? had 128,287, Thunderstorm and lightning safety had 122,983, AED quick facts had 107,118, CPR Pro skills review questions had 98,890, Lifeguard training, swimming, CPR and first aid links had 94,982, swimming vocabulary (which is used as a homework assignment by an English as a second language school in Paris, France), had 86,729, CPR quick facts had 83,070, How to rescue a drowning victim using a reaching assist or a shepherd’s crook had 83,027, snow chain rentals had 80,729, common mistakes in professional rescuer CPR skills had 76,869, Camping Solutions for women had 56,759, Rocky Mountain mammal size comparisons had 54,373, Snow or rain camp must-haves had 53,846, Road trip bingo or scavenger hunt had had 54,134 Simple Secondary Survey Study Sheet had 50,352, Grand Tetons had 48,775, How much water will there be in the Yosemite waterfalls had 47,860, Backpacking Advice had 47,823, Road Trip Advice and Etiquette had 46,326, Cascade Canyon, Grand Teton National Park had 45,638 fast basic neurological exam had 44,693, History of Lifesaving had 43,772 have more fun camping had 43,542, swim workout vocabulary had 43,135, novice swimming had 42266, Safe driving in rain and fog (which is used as a homework assignment by a driving school) had 41,433 hits, wilderness first aid had 41,854, camping equipment checklist had 37,191, Bloodborne Pathogens quick facts had 36,428, Camping Blunders had 35,816, Sneaking exercise had 39,758, Novice swim FAQS had 35,791 and first aid for public safety personnel study guide had 35,312. I take great pride in ensuring the accuracy, correctness, completeness and reliability of the content of this website, but I make no representations or warranties as to the content’s accuracy, correctness, completeness or reliability. The website may contain inaccuracies, out-of-date information / links, typographical errors, or other errors or omissions. Also, unauthorized additions, deletions, or alterations could be made to the website by third parties without my knowledge. If you believe that information found on this website is inaccurate or unauthorized, please let me know. No liability can be accepted by myself, the De Anza College Outdoor Club, De Anza College or the Foothill – De Anza College district, for loss, damage or injury caused by any errors in, or omissions from, the information given. I, the De Anza College Outdoor Club, De Anza College and the Foothill – De Anza College district assume no liability for accidents happening to, or injuries sustained by, readers who engage in the activities described at this website. There are links to other websites from my website; however, these other websites are not controlled by me and I am not responsible for any content contained on any such website or any loss suffered by you in relation to your use of such websites. You waive any and all claims against Mary Donahue, the De Anza College Outdoor Club, De Anza College and/or the De Anza Foothill College District regarding the inclusion of links to outside websites or your use of those websites.